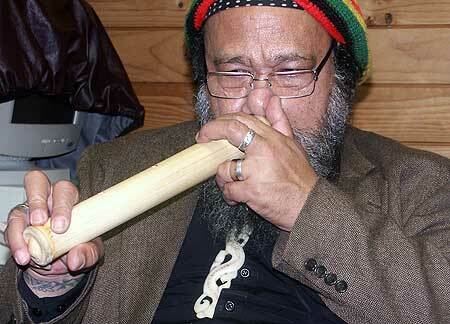 Dr Mahina demonstrates the fangufangu, a traditional Tongan bamboo pipe played by blowing through a nostril. Albert Refiti and Tame Iti. A novel time-space theory of reality based on Polynesian concepts has been making waves among artists and intelligentsia in London following a recent symposium. Newly-appointed senior research fellow Pasifika Dr Okusitino Mahina, based at the Auckland campus, co-convened the symposium with Albert Refiti, head of Art and Design at the Auckland University of Technology, as part of the London International Festival of Theatre held at the Southbank Centre last month. They brought together a group of Maori and Pasifika artists whose work connects with Dr Mahina's philosophical theory based on the Pacific concepts of ta (time) and va (space). 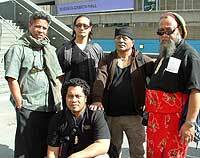 They included Maori activist, artist and performer Tame Iti in a New Zealand-based theatrical performance, Tempest II. In Dr Mahina's theory, “art is defined as a form of intensification of ta - time, and reconstitution of va - space, and involves transformation from a condition of chaos to a state of order through sustained rhythmic production of symmetry, harmony and, more importantly, beauty". Artists at the symposium also took part in an art installation producing interactive art works in traditional and contemporary Pasifika styles and techniques to reflect ta-va theory. Dr Mahina lectured in social work in 1993 and 1994 before moving to Auckland University where he taught Pacific Political Economy and Pacific Arts in Anthropology. Born in the Tongan village of Tefisi, on the island of Vava`u, he was the only one of 11 children in his family to attend university. He graduated from Auckland with a BA with a double major in anthropology and sociology, and masters degree in social anthropology with first-class honours, then completed his PhD in Pacific history from the Australian National University in Canberra. A keen student of Western philosophy, Dr Mahina says he created his own theory as a way of making sense of the world from an indigenous Pasifika worldview and has continued to develop it. He has published extensively on his Pacific-driven time-space theory, while a number of masters and PhD students in New Zealand, Australia, the Netherlands and the United States have embraced the theory and applied it to their various disciplines. “The ta-va, time-space theory is so general and formal that it enters into all fields of inquiry, within and across nature, mind and society,” he says. As well as supervising several Pacific-related theses in his new role at the University, he is currently leading projects on Tongan research, and curriculum development relating to Maori and Pasifika performing arts, as well as writing and editing several projects. They include a volume in a series on Pacific leadership, a collection of his political, educational, artistic and philosophical essays, speeches and writings, and a book of his poems in both Tongan and English. Dr Mahina, who was awarded the Creative NZ Pasifika Heritage Award 2007, is also an accomplished performer of the traditional Tongan instrument, the fangufangu, a bamboo pipe played by blowing through a nostril.